The hotel venue for Ttabamiruka 2014. 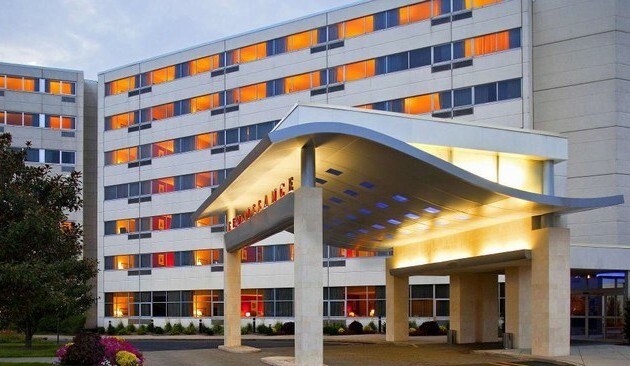 The Woodbridge Renaissance Hotel in Iselin, New Jersey, USA. Disillusionment with Mengo rarely gets voiced publicly among Buganda’s clan heads (Bataka). But a decision by Buganda kingdom to stop them from attending this year’s Ttabamiruka convention in New Jersey, United States, is meeting strong opposition. The controversy was triggered by an August 8, 2014 letter reportedly signed by Kabaka Ronald Mutebi, urging the clan heads to cancel their trip until certain issues have been ironed out. “It would have been good for these issues to be handled with care until there is mutual agreement. For this reason, I request you not to travel for this year’s Ttabamiruka. You will go next year,” reads the letter addressed to Kayiira Gajuule, the speaker of the council of Bataka. The contentious issues are not mentioned in the letter but insider sources say they centre on disagreements between the organisers of the convention and some Mengo officials. Our sources say Mengo accuses the organisers of turning the convention into a political forum dominated by opposition politicians. Mengo claims the convention does not advance Buganda’s real interests anymore. Last year, Mengo officials skipped the convention over similar disagreements. Denis Walusimbi, Buganda kingdom’s spokesman, told The Observer yesterday that the kingdom would not take part in this year’s convention. Katikkiro Charles Peter Mayiga, however, is expected to tour parts of Canada, Chicago and Boston between August 31 and September 8. But the Bataka are not backing down. During their meeting at Bulange on August 12, our sources indicate, the clan heads said they did not want to be used as pawns in the fight between Mengo and organisers of the convention. They also doubted whether the Kabaka indeed authored the said letter. When they met the Kabaka recently and reportedly told him about their plans to attend the convention, he did not raise any objections, they said. The clan heads argued that the decision to bar them from attending the Ttabamiruka was not different from the central government’s decision in 2009 to block the Kabaka from touring Bugerere. “Mengo has never looked after any of us and therefore they have no authority to direct us on what we can or cannot do,” one clan head who attended the Tuesday meeting but declined to be named, told The Observer yesterday. He added that the convention organisers had promised them some perks and some had already processed their visas. At least 14 clan heads are scheduled to attend this year’s convention to be held from August 30 to September 1, 2014 at the Renaissance Woodbridge hotel in New Jersey, New York. The organisers, sources said, hope to use the convention to recognise the clan heads for keeping Buganda united during the time kingdoms were abolished between 1966 and 1993. Walusimbi said the decision to cancel the Bataka’s Ttabamiruka participation had been exhaustively handled. “They know the reason which we raised with them. I do not see the reason why they should go on and on complaining,” Walusimbi said. Meanwhile, with two weeks left to the convention, disagreements between two senior representatives of Baganda living in the United States have deepened. We have seen email exchanges between Wycliffe Lule-Mukasa, the Kabaka’s representative in New York, and Joshua Sekamwa, president of Ggwanga Mujje in New York, each accusing the other of perpetuating divisions among Baganda in the diaspora. In an August 7email, Sekamwa accuses Lule-Mukasa of being a government spy and of secretly mobilising people not to attend this year’s Ttabamiruka, which is being organised by Ggwanga Mujje. “We are aware that you secretly listen in to some of the telephone conversations between senior Buganda officials here and in Mengo. We are fearful that this could be harmful to the security of our kabaka and the katikkiro,” Sekamwa wrote. This email followed one written by Lule-Mukasa on July 2, in which he accused Sekamwa and other officials of building factions among Baganda in the diaspora. Lule-Mukasa accused Sekamwa of doing nothing to heal the divisions. “For me, you will forgive me. I will not go against the Kabaka’s counsel and be part of the people who want to foster divisions among the Baganda,” Lule-Mukasa wrote. Why is Mengo in conflict with it’s own? I think it’s a bit silly for Mengo to try and control every Muganda’s view. We should build a society that cooperates with each other and allows divergent views to flourish as long as those views don’t seek to undermine Buganda.